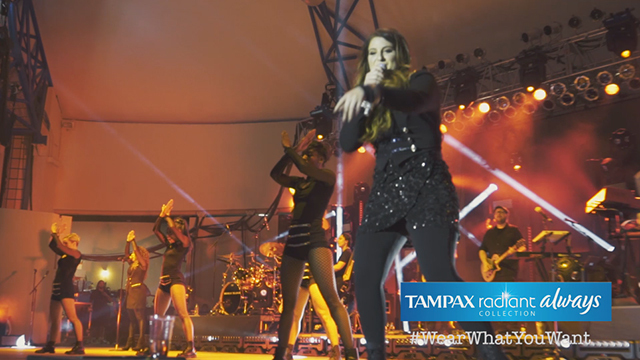 Grammy-winning Best New Artist Meghan Trainor is teaming up with The Tampax and Always Radiant Collection during her “Untouchable Tour,” to encourage girls to have the confidence to wear what they want all month long. Watch for behind-the-scenes access and follow along with #WearWhatYouWant. CINCINNATI--(BUSINESS WIRE)--Grammy-winning Best New Artist Meghan Trainor is teaming up with The Radiant Collection, from Procter & Gamble’s (P&G) leading feminine protection brands Tampax® and Always® during her “Untouchable Tour,” to encourage girls to have the confidence to wear what they want all month long. As a tour sponsor, The Radiant Collection will be onsite at 26 dates throughout the U.S. tour and online to give girls the chance to show off their Radiant styles, and demonstrate how confidence is key to feeling Radiant any day and every day. “I’m excited to have the Tampax and Always Radiant Collection join me on The Untouchable Tour and help spread their message that girls everywhere should dare to wear what they want and what makes them feel good every day of the month,” said Meghan Trainor. Throughout the tour, The Radiant Collection will be giving girls at each stop the opportunity to have fun with fashion. They can show off their confident style when they visit the Wear What You Want Radiant Fashion Closet to receive product samples, snap photos with friends at the photo booth and check out Meghan Trainor-inspired looks. The Radiant Collection combines products from the number one feminine care brands on the planet – Tampax and Always -- to provide a complete offering of premium tampons, pads and liners to meet girls’ feminine care needs. Developed with fashion in mind, The Radiant Collection provides up to 100% leak-free protection, making these products a must-have to rock even the loudest of looks, all month long. “Meghan Trainor has the ‘Dare to Wear What You Want’ confidence that The Tampax and Always Radiant Collection stands for,” said Amanda Hill, P&G North America FemCare Marketing Director. “We are proud to sponsor the tour and provide products to help girls make sure nothing gets in the way any day of the month to be confident and express their individual Radiant styles." All girls are encouraged to be Radiant and check out Tampax.com, YouTube.com/Tampax, Instagram.com/Tampax and Facebook.com/Tampax to get exclusive backstage access / tips on Meghan’s concert fashion and wear what you want style. Girls near and far can join in the conversation online by using the hashtag #WearWhatYouWant on any social platform. With The Radiant Collection from Tampax® and Always®, girls can mix and match protection for every occasion with confidence that 100% leak-free periods are possible. Tampax Radiant tampons feature a CleanSeal™ re-sealable wrapper for quick and easy discreet disposal and a LeakGuard™ braid to help stop leaks before they happen. Always Radiant pads feature light, clean scent and absorbs 10x its weight yet you barely feel it. Always Radiant Pantiliners have a CleanGuard™ quilted core to absorb wetness and odors. Meghan Trainor first made history with her double-platinum 2015 full-length debut Title, which soared to #1 on the Top 200 upon release. A record-breaking musical milestone, it holds the distinction of being the “First #1 full-length debut from a female solo artist since 2010” and “One of only seven albums to sell over 1 million copies in 2015.” The world received its introduction to Meghan via the GRAMMY®-nominated nine-times platinum “All About That Bass” which clutched #1 on the Billboard Hot 100 for a staggering eight weeks. Meghan changed pop music forever on her own terms. To date, the GRAMMY® Award-winning multiplatinum superstar has sold a total of 19 million singles and 2 million albums worldwide. She took home the 2016 GRAMMY® for “Best New Artist,” while her sophomore Thank You album arrived at #3 on the Billboard Top 200, boasting the RIAA platinum-certified smash “NO” as well as the radio hit “Me Too.” Currently on her biggest outing to day, “The Untouchable Tour”, the Massachusetts-born singer, songwriter, and producer stands out as a true trailblazer whose influence resounds throughout pop culture.